Academics trace the origins of the term "Asian American" to 1968 and University of California, Berkeley students inspired by the Black Power Movement. LOS ANGELES — The term “Asian American” appears innocuous today. It’s in the name of film festivals, professional organizations, college clubs and an officially recognized heritage month. 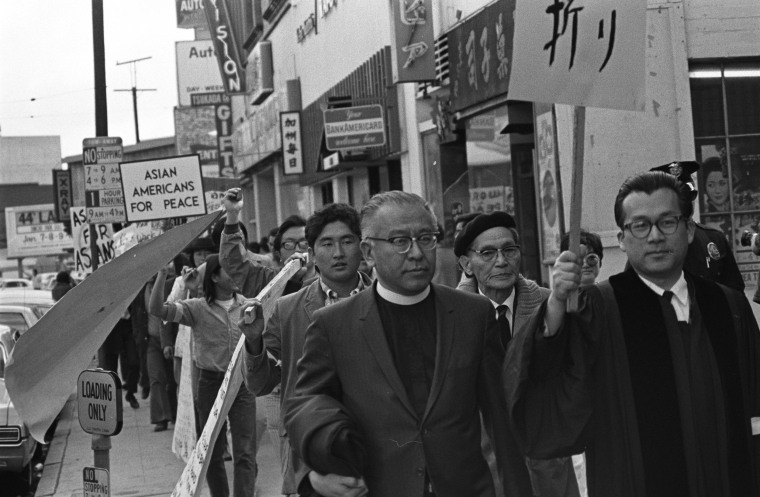 When the phrase Asian American was created — in 1968, according to activists and academics — it was a radical label of self-determination that indicated a political agenda of equality, anti-racism and anti-imperialism. Asian American was an identity that was chosen, not one that was given. Over the last 50 years, however, as people of Asian ancestry in the United States have grown in number and diversity, the term has evolved — raising new questions of who is included in Asian America, what it stands for and if it’s still relevant. “If you were to ask most people who are Asian American, ‘Describe your race or ethnicity,’ they would say, ‘I’m Japanese American,’ ‘I’m Thai, Cambodian, Filipino.’ Very few of us would start out by saying, ‘I’m Asian American,’” Daryl Maeda, a professor of Asian-American studies at the University of Colorado, Boulder and author of the book, “Rethinking the Asian American Movement,” said. Activists and academics trace the origins of the term back to 1968 and University of California, Berkeley students Yuji Ichioka and Emma Gee, who, inspired by the Black Power Movement and the protests against the Vietnam War, founded the Asian American Political Alliance as way to unite Japanese, Chinese and Filipino American students on campus. But Ronald Quidachay, who co-founded the Philippine American Collegiate Endeavor (PACE) at the then-San Francisco State College in 1967, said the term “Asian American” took time to catch on. “Nobody was referring to themselves as ‘Asian,’” he said of the Third World Liberation Front strikes in 1968 and 1969, when Ichioka and Gee’s Asian American Political Alliance joined with PACE, the Intercollegiate Chinese for Social Action, as well as black, Latino and Native American students at San Francisco State to demand ethnic studies and more faculty and students of color. This pan-Asian identity wasn’t necessarily an obvious one. Before this, people of Asian ancestry identified with their ethnic group and didn’t see commonalities with each other. For instance, when the Chinese Exclusion Act was up for renewal in 1902, Maeda said, Japanese immigrants didn’t protest it, and when people of Japanese descent were forced into incarceration camps during World War II, Chinese and Korean Americans often wore buttons stating their ethnicity so that they wouldn’t be mistaken for being Japanese. “In other words, the injustice here isn’t that you’re incarcerating Japanese Americans, the injustice is that you’re lumping us in with them unfairly,” Maeda said. The term Asian American, however, signaled a shared and interconnected history of immigration, labor exploitation and racism, as well as a common political agenda. It was also a pushback against the pejorative word "Oriental." The U.S. Census first used the term Asian American in 1980, according to Paul Ong, a professor of Asian American Studies at UCLA who has also served as an advisor to the U.S. Bureau of the Census. It was only in 2016 that the U.S. government formally banned the word Oriental in federal law, instead requiring the use of the term Asian American. While the term Asian American was used in activist and academic circles, it took decades for the term to become popularized across the country. The turning point, said Helen Zia, a journalist and author of the book, “Asian American Dreams: The Emergence of an American People,” was the 1982 killing of Vincent Chin, a Chinese American who was mistaken for being Japanese at a time when auto workers in Detroit were being laid off in part because of competition with Japanese manufacturers. Voices: Who Is Vincent Chin? Zia, who helped organize the community in response to Chin’s killing, said the national movement that followed helped bring together Asian Americans of all different backgrounds at a time when they made up only about 3.5 million, or less than 2 percent of the total population, according to the U.S. Census. In addition, Chin’s case also introduced the Asian Americans to white Americans. But just as Asian America took shape, it expanded and evolved. The 1965 Immigration and Nationality Act — which changed immigration quotas for non-European countries — and the conflicts in Southeast Asia resulted in new populations from countries such as Vietnam, Laos, Cambodia, India, Pakistan, Bangladesh and Sri Lanka. In addition, the U.S. Supreme Court’s overturning of anti-miscegenation laws in 1967’s Loving v. Virginia led to a boom in the number of multiracial Asian Americans. Even as Asian American remained a strategic political label, this diversity also meant that recognizing each ethnicity on its own terms became a critical tool for advancement. For instance, Kathy Ko Chin, president of the Asian and Pacific Islander American Health Forum, explained that when viewed as a single group, Asian Americans and Pacific Islanders had the highest rates of health insurance coverage in the country in 2013. But by disaggregating the data, she found that not all groups fared equally well — for example, more than 20 percent of Korean Americans were uninsured in her analysis, a higher rate than any other racial category. Knowing this, the APIAHF was able to address the disparity. There are approximately 21.4 million people of Asian descent living in the United States, according to a 2016 U.S. Census estimate. They come from more than 20 countries and are now the fastest growing major racial or ethnic group in the United States, according to the Pew Research Center. With this growth and diversification of the community come new questions about what it means to be Asian American, who belongs, and which issues to advocate for. Sarath Suong, executive director of the Providence Youth Student Movement, which organizes Southeast Asian youth in Rhode Island, said that as a Cambodian refugee, he often feels like he doesn’t fit into Asian America. Deepa Iyer, author of the book “We Too Sing America: South Asian, Arab, Muslim, and Sikh Immigrants Shape Our Multiracial Future,” said South Asians grapple with similar questions of who — and which issues — belong under the umbrella of Asian America. “In the wake of 9/11, South Asians would bring up the need to address national security and that be something that Asian Americans look at broadly, but oftentimes they felt that those issues were not part and parcel of the policy agenda of Asian-American organizations,” she said, citing Islamophobia as another such issue. For others, the future of Asian American is about reconnecting with the term’s roots.